We are recruiting! Click for details! Coro 94 was formed in 2014. It grew out of Cantate Alumni Choir and was named in recognition of the twentieth anniversary of Cantate Youth Choir‘s foundation in 1994 and the strong connection that this group of singers has maintained with Italy. We are a young mixed-voice choir of about 25 singers, aged between 20 and 40. Members come from over a wide area of central and southern England. The repertoire is diverse and eclectic including 5 centuries of sacred, classical and contemporary music, spirituals, gospel, pop and folk arrangements. The choir’s first CD “How Can I Keep From Singing?” features music from Monteverdi and Purcell to Morten Lauridsen and Moses Hogan. We have just a few Saturday or Sunday rehearsals (10am – 3.30pm) for each concert, in or around Bishop’s Stortford, Herts. Rehearsal time is valuable, we work hard, but in a relaxed atmosphere of friendliness and fun. There are normally 4 concerts per year. The two on the weekend before Christmas comprise the annual Family Carol Service in London’s St Paul’s Cathedral and the Coro 94 Christmas Concert. There is a third concert around Easter time and the final concert of the season is the popular Summer Picnic Concert. A short summer tour has become a regular feature of the choir’s calendar alternating between visits to Italy and UK destinations. The repertoire is wide-ranging and includes five centuries of classical choral music; sacred and secular, spirituals, world folk-song arrangements and Broadway. The choir’s recent CD “How Can I Keep From Singing?” features music from Monteverdi and Purcell to Morten Lauridsen and Moses Hogan. The choir is directed by Michael Kibblewhite, one of the UK’s best known choral directors, and Founder-Director of Cantate Youth Choir with whom he won many national and international competitions. He has also directed several other prestigious choirs including Cambridge Chorale, East London Chorus, Harlow Chorus, Harlow Boys’ Choir, Hertfordshire Chorus and King’s Lynn Festival Chorus. 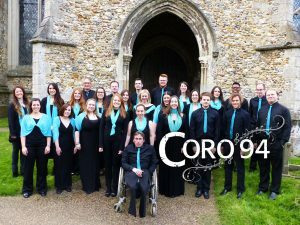 Coro 94 welcomes applications from experienced singers for whom there are vacancies from time to time. Membership is not restricted to alumni of Cantate.